I found this cool idiom on a poster at Whole Foods. I go there QUITE A BIT (often) to get some work done, take advantage of their free wifi, and have some of their prepared dishes. 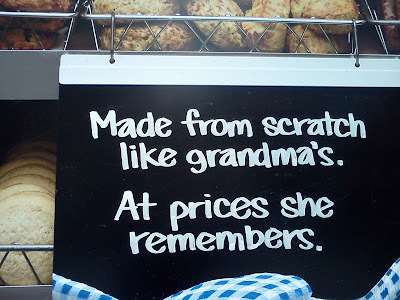 They're A BIT PRICEY (a little expensive); you're definitely paying for some quality fresh ingredients that are MADE FROM SCRATCH, but they're quite TASTY (delicious). With my busy schedule, it's tough to find time to MAKE anything FROM SCRATCH, so I don't mind paying for it NOW AND THEN (sometimes). What about you? Can you MAKE anything FROM SCRATCH? Are you tolerant or judgmental?